As a household name, restaurateur and general good bloke, Al Brown likes to help out where he can. While he often gets approached to donate signed books, restaurant vouchers and bagels, his true ambition is to be an advocate for helping the community, where he can truly find something to sink his teeth into. Garden to Table was a charity on his radar, and was encouraged to visit one of the schools on the programme. As soon as he step foot into Owairaka District School, he knew he found what he was looking for. As someone who struggled with the standard learning environment as a kid, he saw straight away the benefits of incorporating a not-so-standard way of learning. 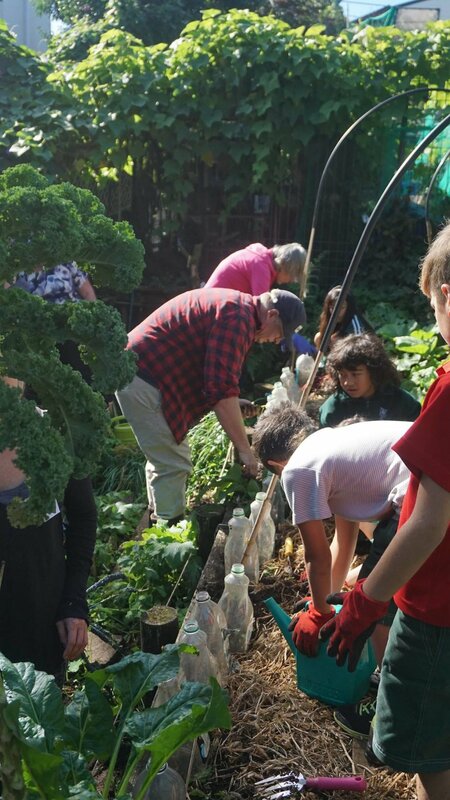 The Garden to Table programme works with thousands of primary-school-aged children all across New Zealand, helping them discover a love for fresh food and skills that will last a lifetime. It’s more than just planting and harvesting vegetables, it’s a different approach to the classroom. The kids not only learn new things like where their food comes from and how to prepare it, it’s also an opportunity to put learning from the standard classroom into practice. Seeing the affect this had on the kids really hit home for Al, who saw two troublesome boys who never have the opportunity to answer questions in class, thriving in the kitchen. He notes that he came away from his first visit absolutely “fizzing”, and knew it was something he wanted to get behind. Al Brown has done more than become an ambassador for the programme, he’s a full advocate and has incorporated his entire brand to helping the programme expand. He not only visits schools himself to help out and show the kids how to prepare and cook a dish, but he encourages the cooks and wait staff from his restaurants to visit the schools to help out with planting, harvesting and meal preparation. Coffee grounds from The Fed are collected twice a week by a volunteer, and are delivered to the schools to be used as fertiliser in the school garden, and at harvest the silver beet grown in these gardens is taken back to Depot to be used as in a special dish, either silver beet dumplings or silver beet gnocchi. To extend the learning environment outside of the classroom, 10 kids every two weeks are invited to The Fed for a restaurant experience, where they learn how things work, help out in the kitchen and help prepare for dinner service at Depot. The idea is that the whole brand is connected to the charity, and creates a full circle of learning. All about good ‘juju’, Al is in it for the good vibes he gets from helping out the community, and wants others to get involved to have the same feeling of pride. Outside of his brand, Al recently invited other restaurateurs to his test kitchen to encourage them to get involved with the programme by adopting a school to support, just as The Fed and Depot do with Meadowbank. By encouraging others to get involved, either through volunteering or partnering with a school in the Garden to Table programme, Al hopes that more schools will also get the opportunity to have similar experiences.